Doc-Tags presents a list of documents (.docx or text files) for selection and then processes the selection using a patented combination of linguistic artificial intelligence, machine learning and Open Document structures to automatically provide a contextually accurate list of Key Words and Key Phrases that have been predominately used for each document. The selected number of Key Words and Key Phrases for each document become the document TAGS and are automatically added to the Document's Tag property, elevating the processed document and its contents for search. A Doc-Tags processed document becomes intrinsically more valuable by the contextually accurate topic key words that have been infused into the document's governing structure. 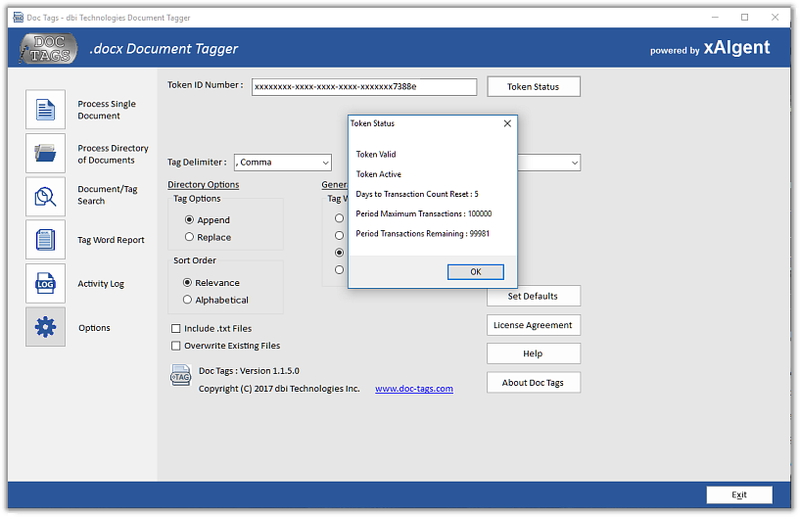 Note: Doc-Tags automatically adding Key Terms to a Document's Tag property does not alter nor modify a document's content, thereby always maintaining the validity of the document. A Document's Tags are used by the Windows Search and Indexing systems, Document Management Systems (DMS), Content Management Systems (CMS), and the like for increasing retrieval and accuracy response, cataloging and accurate indexing of documents. Whether you're looking to improve your own document and content subject search or if you're an Enterprise Information Specialist (CIO) tasked with providing your work force with increased accuracy and access to contextually accurate corporate information, Doc-Tags is the right Solution for you. Microsoft Word is not a required supporting resource, however, the full benefits of Doc Tags will be realized with Microsoft Word or a DocX capable viewer to read and view the Document Tags created and added to a file's profile. 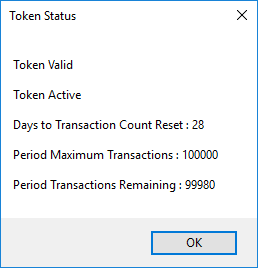 The token status may be checked at any time by selecting the Options Tab (internet connection required). Microsoft Word .docx file format is supported directly. .TXT files - Doc Tags can also be used to tag text (.txt) files. However, the text files are not actually being tagged. Instead, a new .docx file is created with the contents of the text file. The tags will appear in the new .docx file. The new .docx file will be the same name as the text file with a “_TXT01” suffix. (i.e. MyFile.txt will create MyFile_TXT01.docx in the same directory as the original text file). 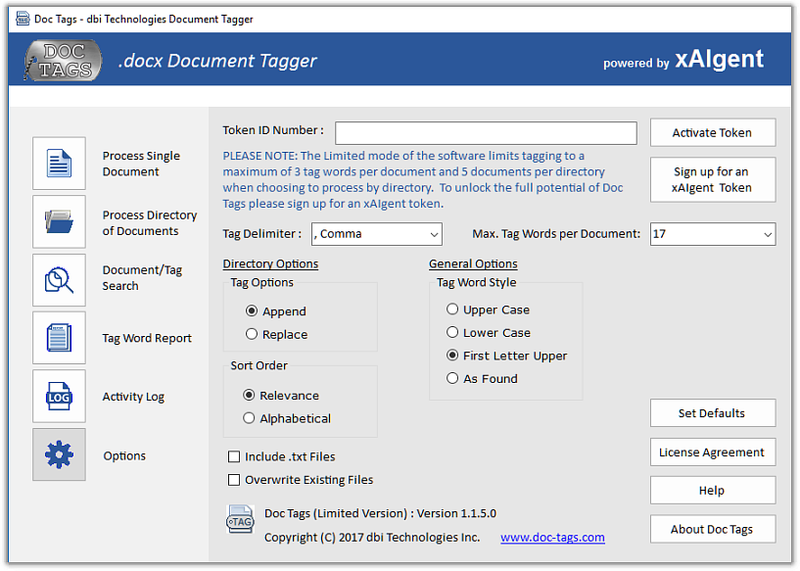 Doc-Tags offers two approaches for creating new Contextually Accurate Document Description Tags for your Text and Word Documents - selecting the per Single Document option or by selecting a Directory of Documents. To add new Tags or to view existing tags for a Single Document select the first Tab - Single Document. To start the tagging of a single document, click on the “Select Document” button, the File Explorer will display a list of available documents - select a document and click 'Open'. The file name and location (file path) will be presented . When a .docx or .txt file has been selected the Tag Options radio button is set to “Append” (See Options Tab), and the document is currently tagged, those tags will appear in the list in blue letters. 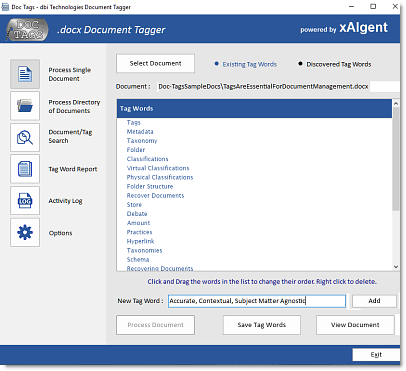 To discover new tags, click the “Process Document” button, text from the selected document will be processed by the Doc-Tags service (xAIgent) and the tag words discovered will be listed in black letters. There may be a small delay before the discovered Tag words appear depending upon the size of the document. Successful requests to the Doc-Tags (xAIgent) service will be recorded as a transaction on the subscription account. To delete a tag word, right click on that word in the list, Doc-Tags will then ask to confirm that you want to delete the tag. To change the order of a tag word, click and drag it within the list. To complete the adding of new Tags to your document click on the Save Tag Words button and save the contents of the current list in to the document profile. If you attempt to exit the program or select a new document before saving the new tag words, you will be asked to confirm whether to save the new tags or cancel the save action. 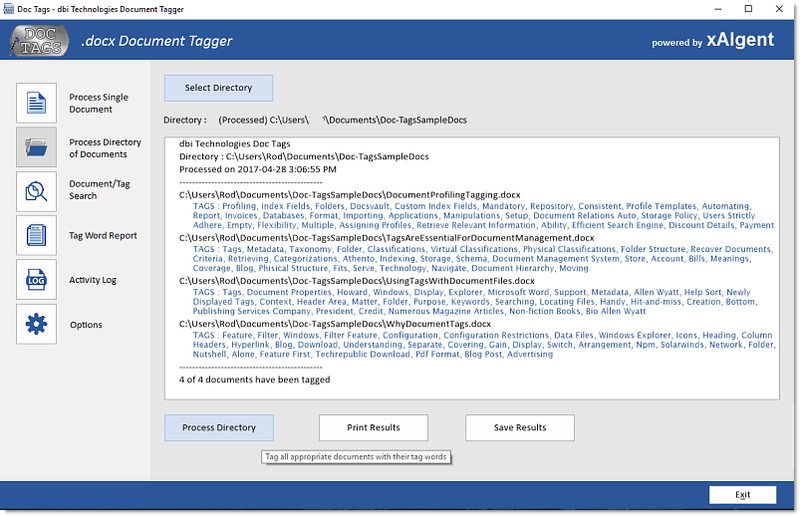 Select a directory of documents for Tagging and have all .docx and .txt file documents within that directory automatically tagged. To start processing a Directory of Documents - click the Folder Icon in the left-hand margin ( Process a Directory of Documents ), next at the top of the program window click the Select Directory button and from the list presented choose a directory containing the desired documents. Once the directory has been selected, click the “Process Directory” button to start tagging the documents. As each document is being processed, its status will be displayed and the listed results can then be printed and/or saved with the Print Results and Save Results respectively. Note: Successful requests to the Doc-Tags (xAIgent) service will be recorded as transactions on your subscription account. 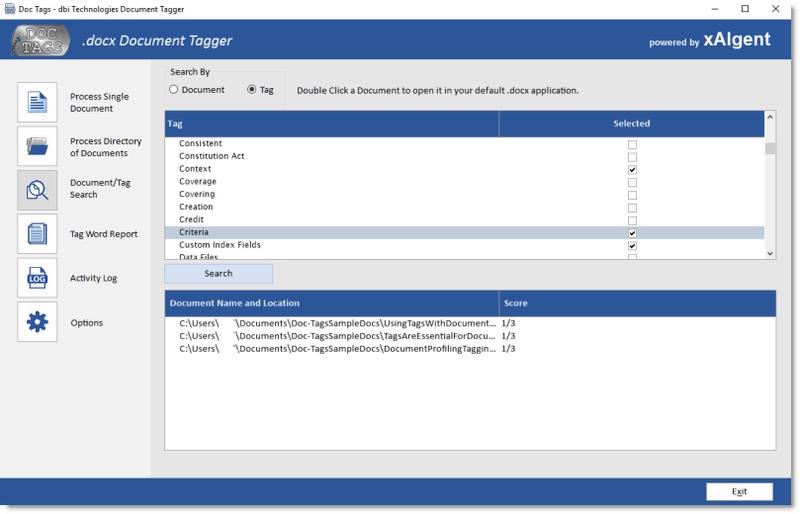 Every time a document is tagged the Document file name, location (file path), and discovered tags are recorded in the local user's Doc Tags database. These attributes are used by the Doc-Tags Search Utility for fast, accurate, contextual retrieval based upon the search criteria used. 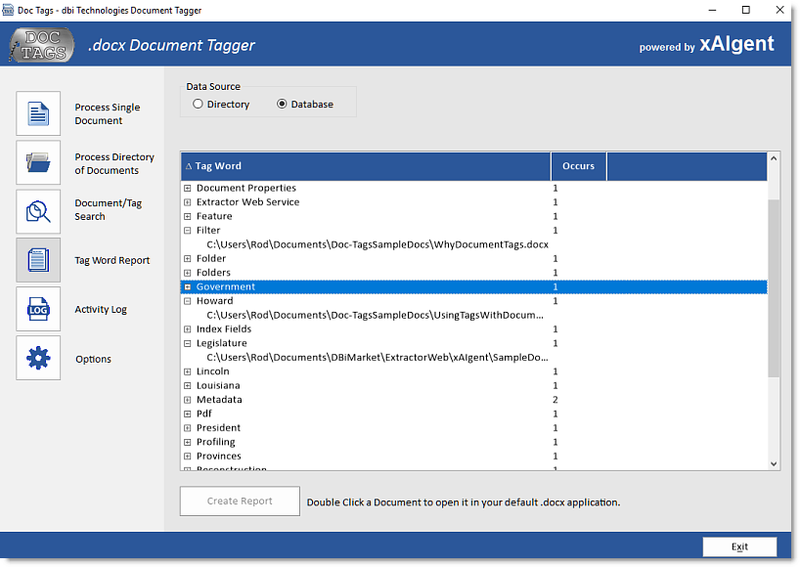 The Doc-Tags Search Utility supports searching the local database using a single document reference or a group of documents. The search utility also supports searching by a single Tag or a selected Group of Tags. Once the search criteria are set, press the search button and the Doc-Tags Search utility will return all Documents that contain a match with one, many, or all of the Tags based on the criteria set. The list of search results are presented in descending order based on the number of matching Tags. To the right of each document/location in the results list, a score is presented indicating how many of the tags were matched based upon the search criteria. NOTE: To view a document, double click an item in either the top or bottom list area. Doc-Tags will then open the document in a .docx compatible viewer available on the local system (i.e. MS Word). NOTE: The tag / document search and reporting options do not register transactions on the subscription account. The Tag Word Report creates a report of all tag words saved to the local database and in which document(s) they reside. NOTE: To view a document double click on it in the list. The program will then attempt to open the document in a .docx compatible viewer (i.e. MS Word). The options tab presents the parameters that control how the program works and how a document is tagged. Subscription ID : The Subscription ID number issued to unlock Doc-Tags' full set of features. Activate : With the Subscription ID issued entere it into the Subscription ID edit box and click the Activate button to unlock the full set of Doc-Tags features. Once Doc-Tags has been Activated, the Activate button will change to “Token Status” providing direct access to the Subscription Status. Purchase Subscription : This button only appears in Free mode. Click the button to open the purcase subscription secure web site. Tag Delimiter : This option determines the character used to separate tag words. 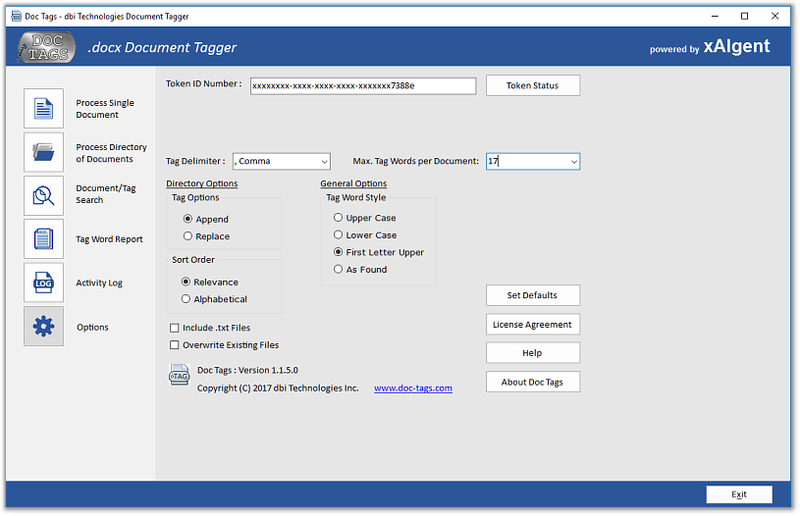 Maximum Tag Words : This option determines the maximum number of tag words that can be presented for each document. 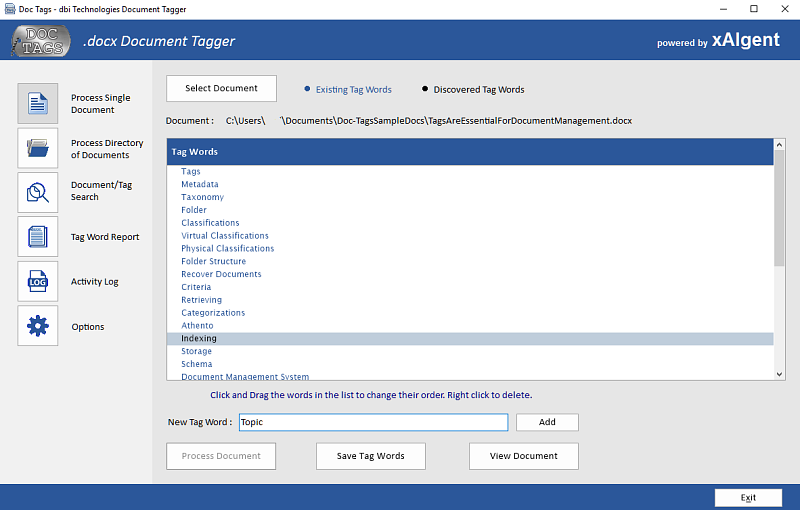 When Doc-Tags is in Limited mode the maximum number of Tag words that will be available is set to three (3) regardless of the selection made. With a current subscription the maximum number of Tag words will be available, depending upon content and length of document. Append : The newly discovered tag words will be appended to any existing tag words in the document. Recommended for documents being tagged for the first time. Replace : The newly discovered tag words will replace existing tag words in a document profile. Use this option if a document has been heavily edited since it was last tagged - existing tags may no longer be relevant. Include Text Files : Determines whether text files will be included when tagging a directory of documents. NOTE: only Word document files with a '.docx' extension or Text '.txt' files will be processed. Set Defaults : This button returns all options, with exception of the Subscription ID number, back to their default values. Help : This button provides direct access to the Doc-Tags online documentation and help guide. 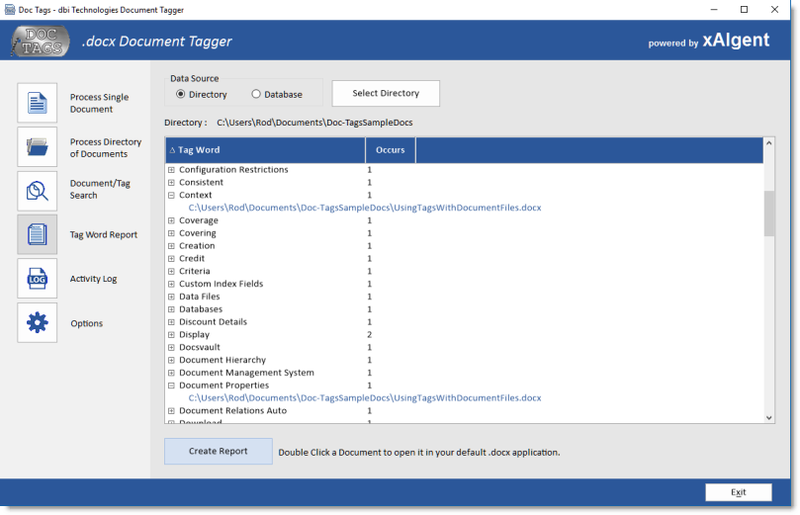 Every time a document is tagged, the date and time along with the file name and location of the document are stored in the Doc-Tags local Activity Log Database. The Activity Log contains a list of documents processed by Doc-Tags and sorted in ascending order by Date/Time of processing. At the end of the list is a running total of the number of documents processed by Doc Tags.